and it still may be some gold in there, but there’s no telling because the kids haven’t dug through it in about forever. The last time they did (I can’t remember when it was, only that they were both a whole lot shorter), my son came running into the house with what looked like a piece of gravel. How it all started was they’d seen a TV show about prospectors out West. One of them had struck it rich. The kids, young enough to believe if that sort of thing could happen to some guy in California then it surely could happen to them all the way in Virginia, decided they would have a go at it. They used the yellow plastic sifters we’d gotten at the beach that summer and went on out to the creek beside the house. It lasted about half an hour. Wasn’t so much the sifting they minded, it was the snakes. But that pile of dirt and rocks at the end of our yard was well away from any lingering serpents, plus there was the fact it sat near enough to the neighbor’s oak to give them shade from the sun. There my two kids parked themselves for most of a whole summer. They separated dirt from rock and rock from what they called “maybes,” pebbles which gave off something of a shine and so would be studied later. Took them a few weeks, but that whole pile ended up being moved a good three feet. Sometimes I’d sit on the back porch and watch them. There was an order to the kids’ work, a methodical examining which carried a strong current of patience beneath. Neither of them minded getting dirty or sweaty in the process. To my knowledge that vein of leftover driveway gravel and leaves scattered by the wind didn’t pan out. My kids never did find their gold. Something other came along to capture their attention. Dragons, I believe it was. My daughter had read a book about dragons, which are vastly superior to gold, and so her and her brother spent the next few months out in the woods rather than in our rock pile, looking for dens and nests and serpent eggs. I thought about their search for treasure this evening when I had the dog out and her sniffer led us both to the end of the yard in a meandering sort of way. Thought maybe I’d go inside and ask the kids if they remember the summer they spent sitting out there panning and sifting. I guessed they maybe would. If not, I would remind them. Because there’s a lesson in that old pile, I think. One both of my kids would do well to remember. They’re both getting toward that age when the world can lose a bit of its color. Things don’t seem so wondrous anymore. There are obligations and responsibilities. Things that have to get done. Adulthood is looming, for both of them. There will come a time when they’ll find much of the world is one sort of muck or another. Living can be a messy business. No one can get from one end of it to the other without getting a little dirty in the process. But what I want them to know is there’s still treasure in there, treasure everywhere, so long as they’re both willing to put a little work into finding it. Won’t always be easy. Sometimes you’ll grab whole handfuls of days and months and even years and find little in there that sparkles. But you’ll always find something, that’s what I’m going to tell them. You’ll always find enough to keep you going. And really, that’s all we need in the winter seasons of our lives. A little gold to keep us putting one foot in front of the other, to keep us warm and waiting for sun. I’ll say I’m a writer because I can’t speak. At least not well and not in front of large groups of people I do not know. I’ve done so anyway, and many times. And truthfully, I do just fine as long as I don’t count the “aint’s” and dropped g’s that come out of my mouth. The invitation to speak that I received recently wasn’t one I could pass up. It wasn’t a fancy conference, wasn’t in a fancy city. It didn’t pay well (actually, it didn’t pay at all). It was instead for career day at the local elementary school. It isn’t often that I get to play author, much less play one for an entire day. Despite the props I brought along—five books, a typed manuscript, and one bulging notebook—I knew it would be a rough road to travel. After all, I was going up against firemen and police officers and radio personalities. A writer would have a tough time competing with that with a bunch of grownups, much less a hundred fourth graders. But as it turned out I didn’t have much to worry about at all. Sure, they were fourth graders—that peculiar brand of kid to which both reading and writing are anathema. So I started with the fact that when I was their age, I hated reading and writing, too. I’m smart enough to know that kids aren’t much interested in publishers or first drafts or the horror that is the adverb, smart enough to know that adults aren’t much interested in them either. But I’ve found over the years that everyone, regardless of age or interest, perks up whenever I mention a writer’s primary gift to the world. They get to create magic. They didn’t believe me, of course. Not right away. One kid asked me to make his pencil disappear if I knew magic. Another wanted me to guess the number she was thinking. I told them I couldn’t and that it didn’t matter, because the magic writers do was better. It was the greatest magic of all. It was the magic of writing words down on a page that make pictures in other people’s minds. It was the magic of being able to create entire worlds from scratch and put anything I wanted to in them. It was the magic of being able to touch another person’s heart, a person who might live far away, someone you’ve never spoken to and likely will never meet. And best of all, I told them, is that everyone possesses a bit of that magic. Anyone could be a writer. Didn’t matter if you were rich or poor, didn’t matter what color you were, didn’t even matter if you went to college or not. That magic was still in us. It takes time, of course. All magic does. But I told them that if they did three simple things, that magic would grow and eventually spill out. You have to read, I said. Every day. And you have to write. Every day. And most important of all, you have to believe you’re special. Because there is only one you in this world, and the way you see life is different than the way anyone else who’s ever lived has seen it. That’s why your story is so important. So needed. After all, that’s what the magic is for. Turns out that an informal poll conducted by the teachers placed me second of the day’s top speakers. The winner was the radio guy. I wasn’t surprised. I can’t compete with someone who’s met Taylor Swift and Trace Adkins. I wouldn’t even try. But a teacher told me that the next day when it came time for her class to do their journal writing, there was much less grumbling than usual. They were ready. Eager. When she asked why, her kids told her they wanted to make some magic. The people next to us were an extended family—nine of them, arranged in descending order from grandpa to grandchild, all occupying three tables that had been placed end to end in the middle of the restaurant. Most of their attention was focused on the grandchild. It was his birthday. He looked eleven, maybe twelve. Bright eyed and brown haired. The first volleys of acne were landing upon his chin. The boy did not seem to mind. He nodded and smiled and offered a few words here and there. It was the typical pre-teen response to nearby family, one that said I love you people but I’m now too cool to show it. I took all this in (writers will invariably call this sort of thing Research, which sounds much better than plain nosiness) and nearly moved on to the next table when the waiter arrived. He inquired as to the quality of everyone’s meal and if anyone would like dessert. The birthday boy’s face turned the color of his encroaching acne when everyone announced the occasion. “I’ll be right back,” the waiter said. 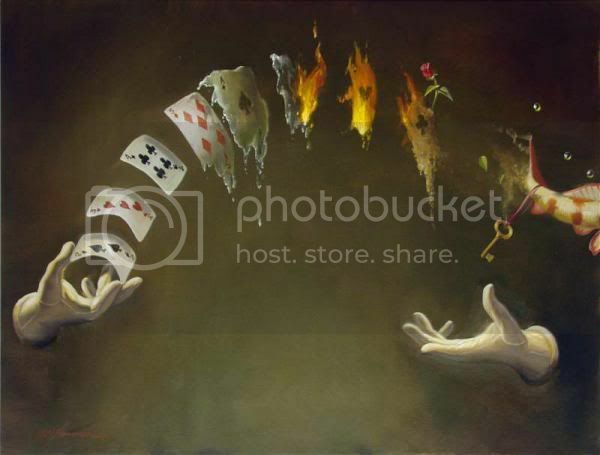 He produced a deck of cards from his apron and fanned them out face up in one fluid motion. Flicked them back with one hand. He smiled and winked at the family, who had by then already begun inching their chairs forward for a better view. Another shrug and another snort. It took prodding from both mom and dad, but the boy did. He took one from the middle of the deck and held it close. He peeked and then let everyone else do the same. Back in the middle it went. The dishwasher slid the cards back one-handed again and held the deck beneath the birthday boy’s chin. Neither mom nor dad could get him to budge this time. Grandma stepped in. The boy blew on the deck and the dishwasher tapped it with his forefinger. He flipped over the top card. I didn’t have to see the card to know the trick had worked. The birthday boy’s bewilderment did that. The slaps on the table by dad and grandpa helped. “It’s a trick,” the boy said. Another fan of the cards. The boy picked one from towards the back this time. He placed it in the middle. He handed the deck to dad to shuffle, who handed it to grandpa, then back to the birthday boy, who shuffled once more for good measure. Then he handed the deck back to the dishwasher and smirked. The dishwasher held the deck beneath the boy’s chin, who proceeded to not so much blow as snort. There was a tap on the deck. The top card turned over. I will say I was disappointed. I wanted to see the trick. And I’ll say the boy who thought himself a man was pretty disappointed too, even if he was too old to show it. The boy nodded and picked up his plate. His mouth fell open. His card was taped to the bottom. The family applauded. The dishwasher bowed. I have no idea who that boy was, but I guarantee I will always remember his birthday. I guarantee this too—whatever presents he was given, the best one came from the dishwasher. It was a reminder that no matter how old you think you are, there’s still a little kid hiding inside. And no matter what we think, there is magic in this world.